Beach pails are a great way to hold favors or to decorate. 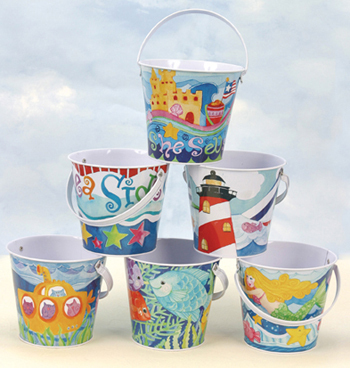 Beach tin pails are available in several sizes and colors. Beach pails are great for beach weddings and destination weddings. These beach scene tin pail are perfect for beach wedding favors or centerpieces. Each has a plastic liner. Price is per set of 6. Each beach scene tin pail measures 4 1/4"H X 5 1/2" Opening. 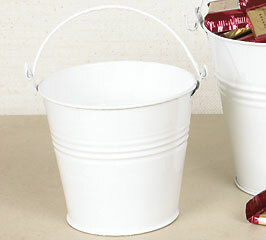 Galvanized Favor Pails Galvanized favor pails offer your guests sweet gratitude by the bucketful. 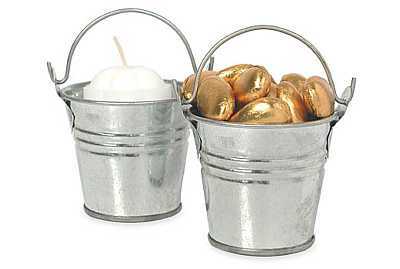 These galvanized favor pails add a bucolic touch when filled with tasty treats, and are ideal as votives sprinkled throughout your reception space. Galvanized favor pails are perfect for holding our Petal Votive Candles, or to fill with edibles such as Candy Conversation Hearts and Jordan Almonds (all sold separately). Available in White or Silver-tone, pink or light blue. 2 1/2" D x 2" H. Color is consistent throughout entire pail. Perfect to use with beach wedding favors. Price is per pack of 6. These retro beach tin pails are great for beach wedding favors or centerpieces. They feature retro beach theme designs. 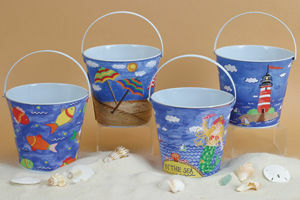 The beach tin pails are sold in a set of 4. The price is per set of 4. Each tin pail measures 5"H.
These rose tin pails are great for spring and garden wedding favors or centerpieces. 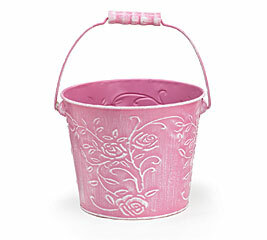 The pail is sweetly embossed with a rose design and wood handle. 5 1/4"H X 6 1/4"Opening . The blue beach tin pails are sold in a set of 4. The price is per set of 4. Each tin pail measures 6 1/4"H X 7"Opening. 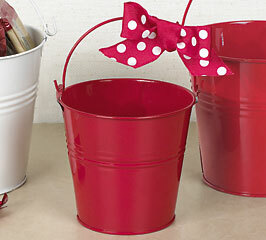 Red tin pails are perfect for beach wedding favors, garden wedding favors and centerpieces. There are two sizes available. Price is per set of 6 tin pails. The small tin pails are 4"H x 4" Opening. The large tin pails are 4.75"H x 5" Opening. Price is based on size of tin ordered and are listed in the size option box. Bow not included. White tin pails are perfect for beach wedding favors, garden wedding favors and centerpieces. There are two sizes available. Price is per set of 6 tin pails. The mini pails are 2" x 2". The small tin pails are 3"H x 3" Opening.The medium tin pails are 4"H x 4" Opening. The large tin pails are 4.75"H x 5" Opening. Price is based on size of tin ordered and are listed in the size option box.